Toothpaste is an everyday essential, it can be found in every home and it is used every day (twice I day I would hope), but there is so much more to it than just a cleaner of teeth. 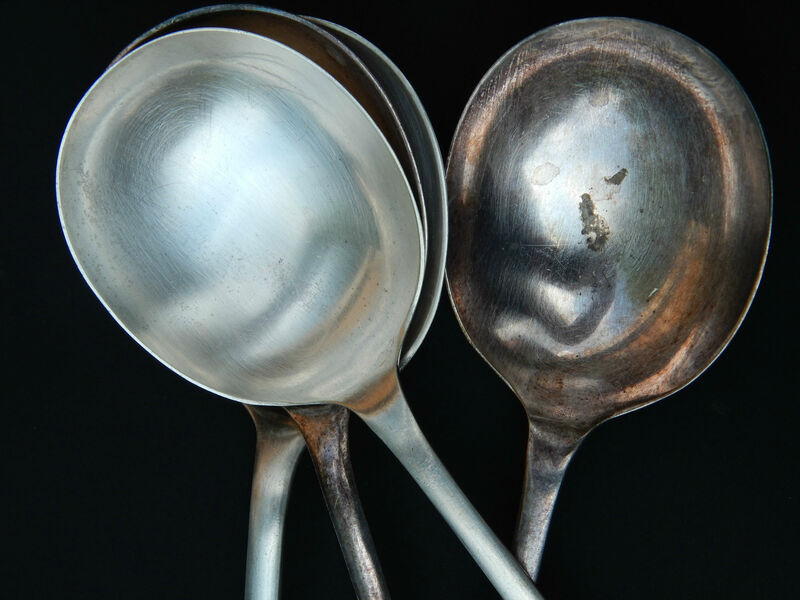 A few weeks ago I picked up some old silver spoons at the car boot sale; they were lovely but very dirty and discoloured… Guess what I used to clean them? Yes, you are right, toothpaste. 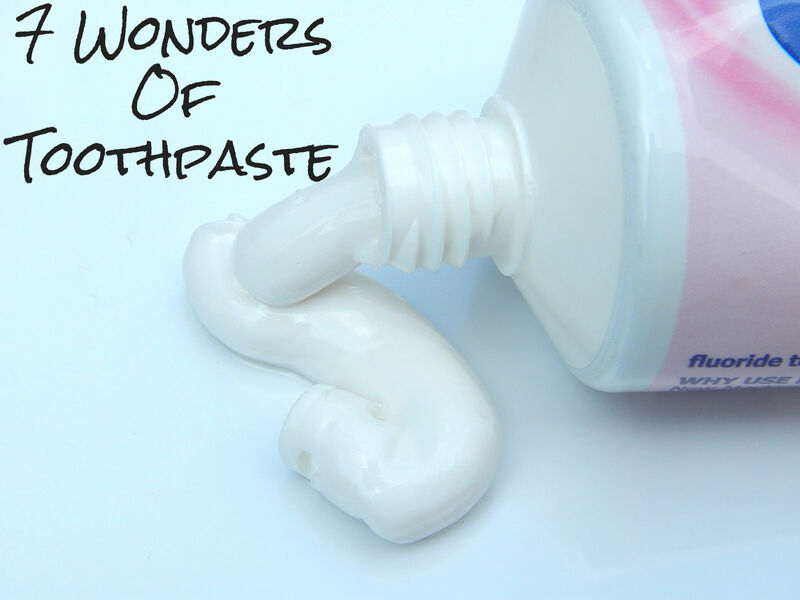 This gave me an idea… a selection of all known to me uses for the wonder that is toothpaste. So here you go… my selection of 7 toothpaste wonders. Just as stated above it works wonders on silver, gold, brass or any other kind of dirty metal for that matter. Simply use a cloth or the soft side of a sponge, wet it, apply some toothpaste and rub it in for a bit. You will see the dirt removed in no time. Burns and bites can be treated with toothpaste. It is especially effective on mosquito’s bites as these are extremely itchy. Just pop a small amount of toothpaste onto the affected area and you will feel the relief within a few minutes. The same applies to burns, a little toothpaste can stop burns from blistering (just remember I am talking about minor burns which do not involve an open wound). Due to its ingredients toothpaste can be used in many ways to help us with our every day beauty routine. First of all it works as a perfect hand cleaner. It will help to get rid of unwanted smells like garlic or onion, but this isn’t all… it also works as a finger nail cleaner. Have you ever gone gardening and forgot to put gloves on… if you did, you know how hard it is to wash your nails afterwards. The next time you are in this situation simply rub them with toothpaste and it will be much easier to get them back to their full glory. Secondly it can help to reduce facial blemishes. It helps spots dry out so just put a small amount of toothpaste onto the affected area and leave overnight. Dirty shoes, irons, carpet or clothes stains or even crayon stains on painted walls can be treated with toothpaste. Simply treat affected, stained area with a damp cloth and a bit of toothpaste; repeat if needed. It really works great on scratched leather shoes, coats, handbags etc; it minimises the marks leaving the leather looking much better. It also works perfectly on the dirty soles of trainers; it can bring those whites back to life. 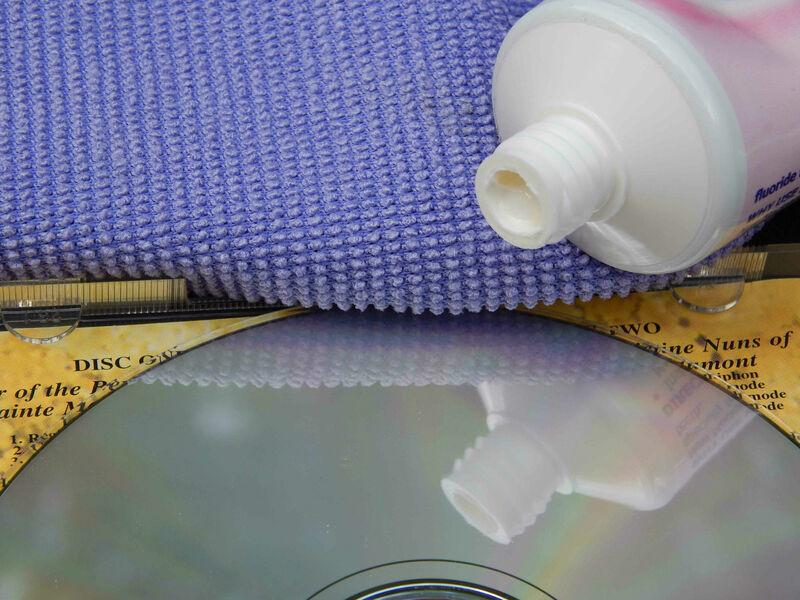 CD and DVDs get scratched like everything else. A bit of toothpaste magic can help. It also works well on car headlights or bikes for that matter. Scratched headlight give less light so treating them with toothpaste every now and then can be highly beneficial. It will also work on your smartphone screen or a tablet if you are not protecting it with a screen protector. Every parent knows that baby bottles after repeated use develop a sour-milk smell, which simply doesn’t want to go away. Rub some toothpaste inside the bottle and pop it into dishwasher. It will remove the smell and leave your bottle smelling nice and fresh yet again. This is perfect for any goggles – skiing, swimming and diving… it will work all the same. Simply rub a small portion of toothpaste into each lens, rub gently, rinse and… No more foggy goggles! That’s it. This is my list of unusual uses for toothpaste. I just want to add that standard, ordinary, old-fashioned toothpaste works best. You really don’t want any triple colours malarkey or a whitening type (this can leave bleach marks on fabrics) or anything with scrubbing particles inside of it… just use a cheap white, smooth toothpaste. Also do not scrub like a mad man (or woman). Use it in a gentle manner with a soft damp cloth. It is much better to repeat the process if needed than over scrub and leave unwanted marks. Did you ever use toothpaste in any of these ways? And if you know of any other uses for it, please share. Next > For the good of your health, Get A Pet! it is very useful post.in this post we get so many new things. thanks you so much for sharing it. I’ve used it on spots before (although must admit that it made my spots worse so don’t do that any more), but have not heard about any of its other uses. It sounds like it should become my next cleaning essential! I have heard of some of the uses before. I have indeed used on silverware, cd’s and headlights. It’s amazing what some products can do besides what they were made for. When I Googled it there are 100s more uses, but I’ve never tested it myself. Going to try all others and update my post as I try different ways of using it. I real enjoyed your post! I am a qualified dental nurse and had not realised toothpaste was so versatile! I did used to use on my blemishes as a teenager! Oddly I had heard of all of these. The amount of Xbox games that have had the toothpaste treatment in our house is beyond belief. I must admit Xbox games get scratched a lot. It must be due to position of the console and drive placement… poor design if you ask me. Did you know that if your Xbox scratches your game too much, they will replace it? It can also use as jewelry cleaner. I have tried using toothpaste too cleaning my DVDs and it works! Coolness, haven’t tried using tooth paste as anti-scratch remedy. I’ll try it right away. I did the old spot trick as a tennager and I knew it was good for metal but most of these AFR new to me! I have used it for shoots and bites before, but most of those are new on me, great tips! When I was a teenager we all used toothpaste for the drying out spots trick! News Alert: You can actually use the stuff for cleaning teeth, too! I never understand why my teeth aren’t sparkling white when toothpaste has such amazing power! I had no idea you could use toothpaste for some many other uses than just teeth! Amazing, I’ll give some of these a go! I always use if for my running shoes and the one with a “white effect” is the best to clean discoloured fingernails &hands :o) I will try it as a meatl cleaner, thanks!